Play; in a new way. Continuation of The month of APRIL, thus far!! Here are a few more photos from this month and some neat ideas that we integrated within our classroom. Our students noticed the sun shining through our windows and are quite engaged in the light projector, shadows and reflections currently. One student noticed the projector paper were translucent and when you write on them you can still read the letters when you took the paper off. And only one side can erase the letters. Within this discovery the question of what would happen if we used paint on the paper. That one question resulting in the what is documented below. These lovely, bright paintings now hang in our window, where the sun shines in and sends such a beautiful ray of colours our way! 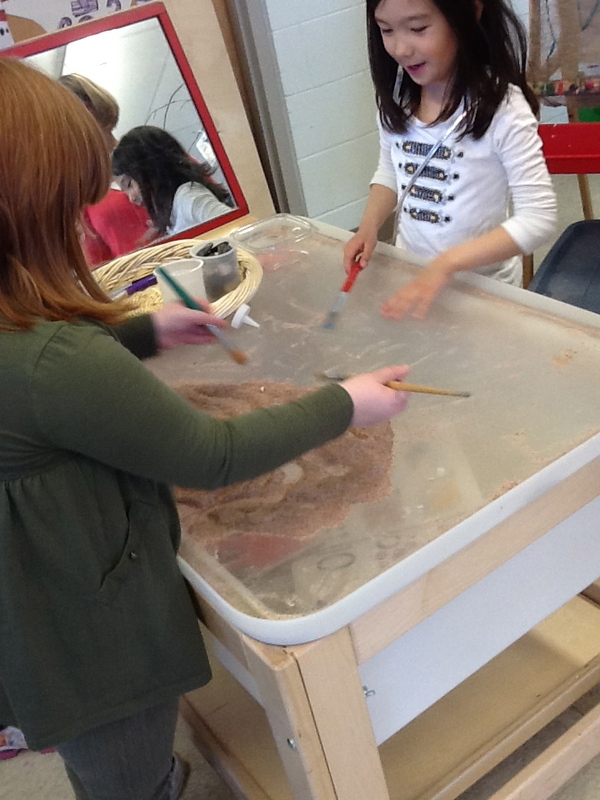 Our students LOVE LOVE LOVE sensory play! They have been copying words and names throughout the last several weeks. 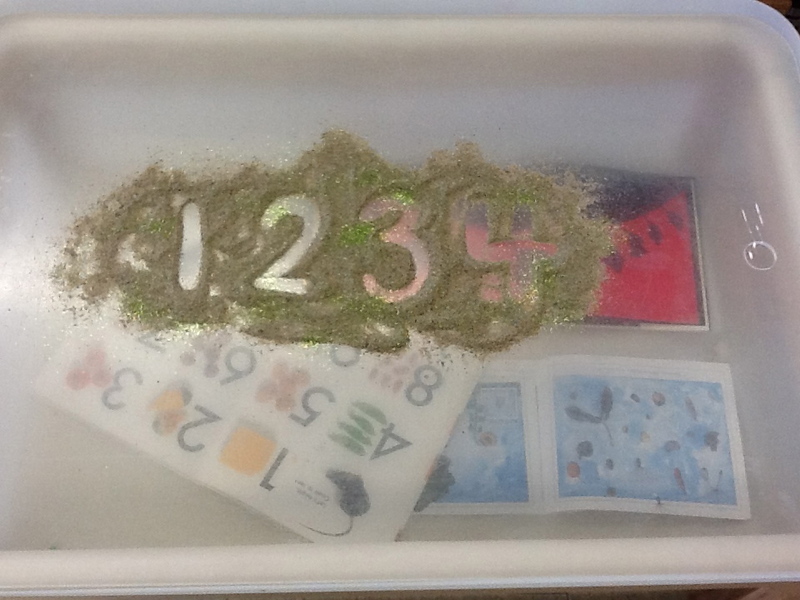 Therefore under the clear sand cover we placed several books with big and bold letters, numbers and words. Leaving sand on top; instead of inside the sand box and left several tools in a clear container on top as well. 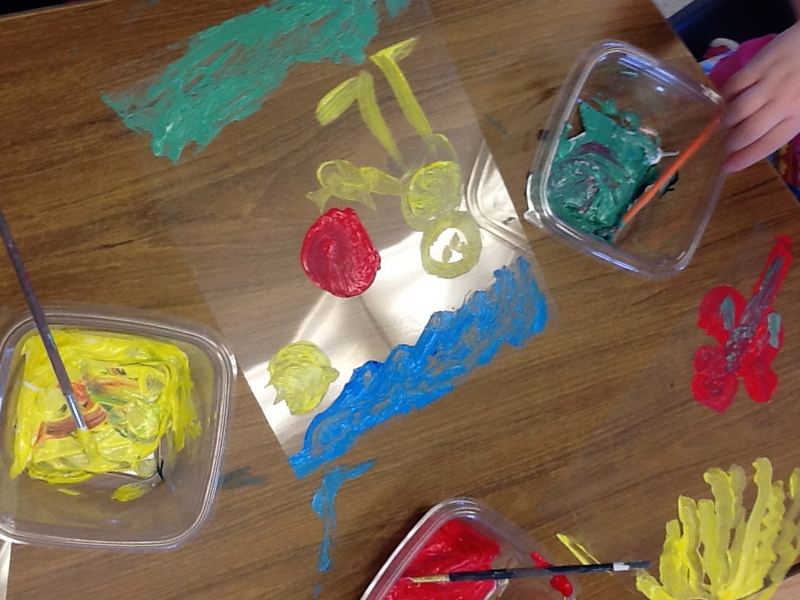 I also decided to place a mirror close by to give a different perspective and to create an inviting activity. They loved this idea. I saw it used in many different ways throughout the week. 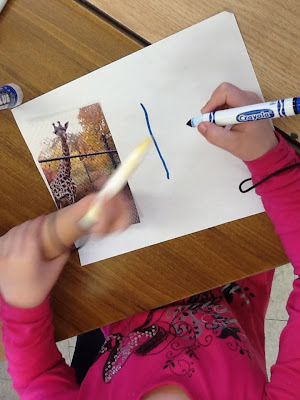 Drawing pictures using popsicle sticks, using dry paint brushes to make letters, print their names or make up games with others. One student added large stones and shells to the top as well. 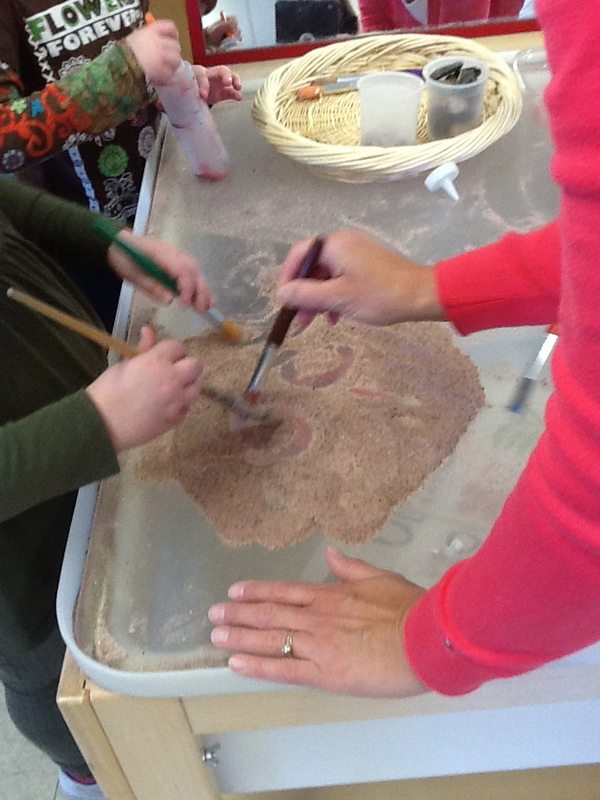 This week we will add coloured sand and a light inside the table to give a different idea to the table. We shall see what happens. I am sure most of you can relate to this. At home I have a ton of old photos that are pictures of landscapes or zoo animals or farm animals. A few days ago I went through an old box of photos and came across an extra set of zoo photos from a trip I went on in high school. 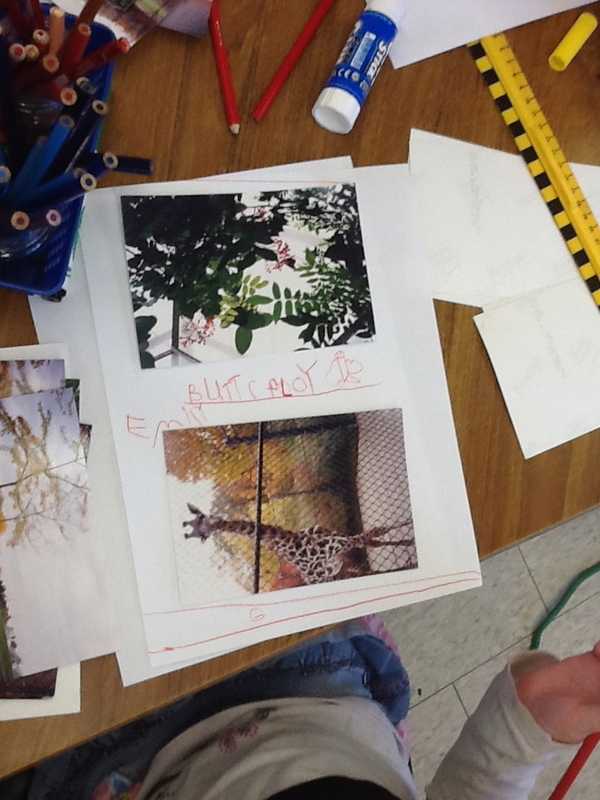 Our students just ADORE the idea of animals and anything that relates to them! I knew this would be a big hit. No matter what type of activity they are engaged in, some how animals are almost ALWAYS apart of it. I brought in about 30 photos and placed them at a table with blank paper, rulers, glue, markers and pencil crayons. Not sure what I was going to invite but I was hoping to spark some interests. Of course they immediately came over to look through them. Asking questions about them and asking about my trip to the zoo. Some students took them to their build block locations and used them as props, Two girls created puppets for their puppet show with a few photos and some made cards. A small group of students began gluing them onto the blank pages and writing the animal's name beside them. As I inquired about their writing and ideas, it was explained to me that they were creating a "research book" about animals to use in our quiet area "library." They asked to cover it and with their assistance we went ahead and laminated their book. Were they ever excited about this?? They have begun to take it home to read to their parents and are doing a great job being responsible bringing it back to share with the rest of our students. Tree ties and beading with playdoh! Here's just a fun and different way to incorporate three items that you may have within your room. 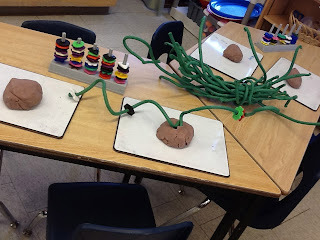 These tree ties were purchased from the Dollarama, homemade playdoh and large beads that most kindergarten classrooms have stored on their shelves. The month of APRIL, thus far!! 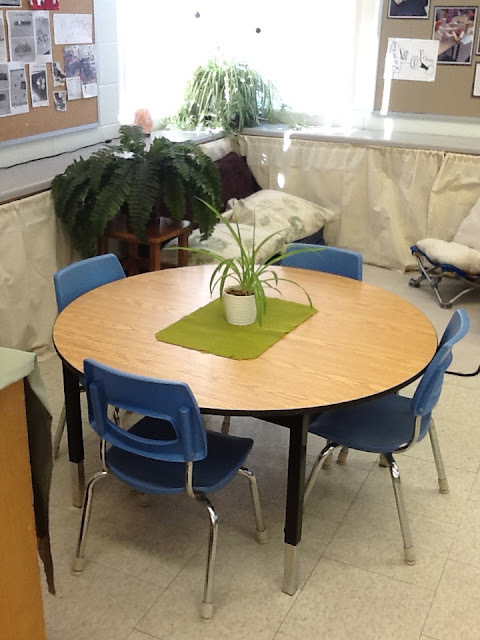 In our room the quiet area is definitely a place that is visited often by our students. But it just hasn't felt "right," since the beginning of school. Either it seemed like it was promoting more noise, large social gatherings or toy hoarding. (hehehe) I wanted to create an open, inviting and comfortable and calming place to relax, read, chat or take a rest. And it just didn't feel like any of those things. I have changed this area around about 7 times since September hoping to find something that worked. Recently this week a teaching partner and I played around with the options of furniture in our room and came up with what the two pictures below show. I must say that this is the first time that it has felt "right." The students have had it been apart of their environment for three days and it seems to attract calmness. Inviting them to relax with a friend, read or write. We shall see what the days ahead bring. With the nice weather on it's way, it has brought alot of attention to the outdoors for our children. Spying out the window, reading spring books and noticing signs of seasonal changes are all things that have happened over the last two weeks. Also, birds seem to be the interest as well. Our "nesting" adventures began as our students found a nest outside. We were asked about the birds who built it, what was inside and from simple research and documentation it began to stem a two period (now) of birds and hatching. We are also lucky enough to have access to an egg incubator that was purchased by one of the teachers in another kindergarten room. We are able to expand our children's interest by observing daily what is happening. Questioning what is inside, what is new, why we need to turn them daily. The excitement is intriguing! 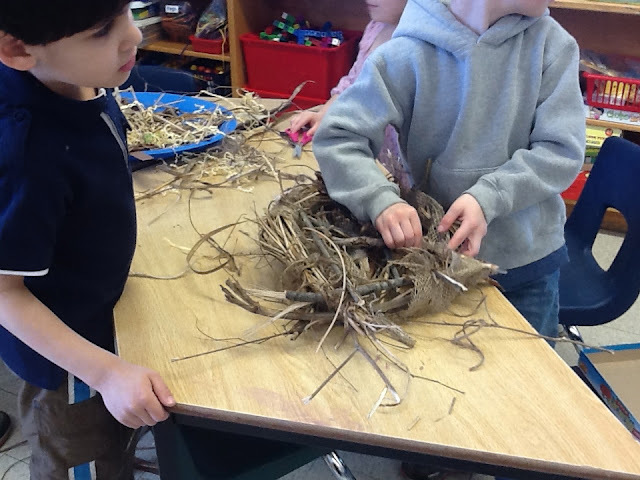 As a provocation; a teaching partner and I went hunting around our homes for natural items that would possibly be used to build a birds nest. As the student's came in and saw the table of "stuff" they were super excited to find out what we could build. 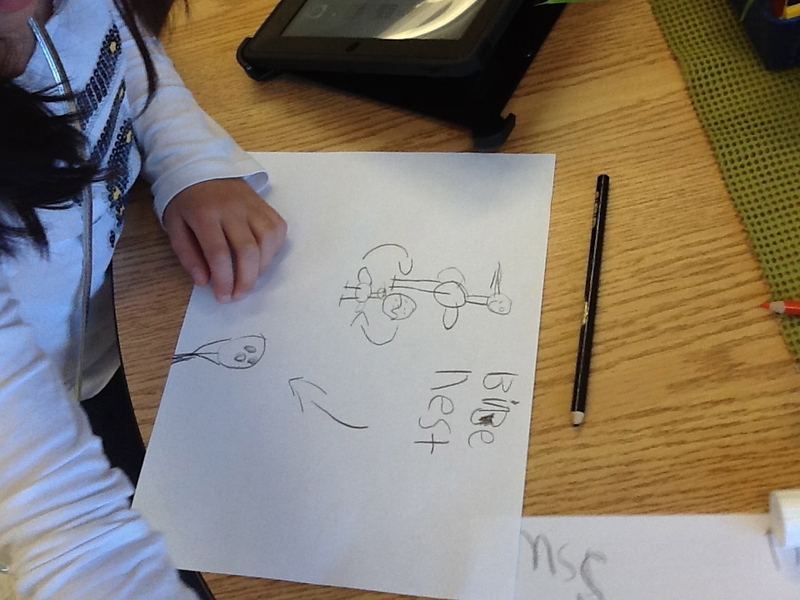 Immediately a NEST was suggested and off to research HOW a bird builds a nest, they went. 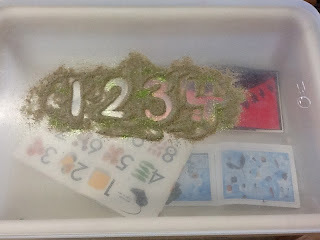 We found a simple you tube video, watching a bird bring pieces of natural thing and create his new home. 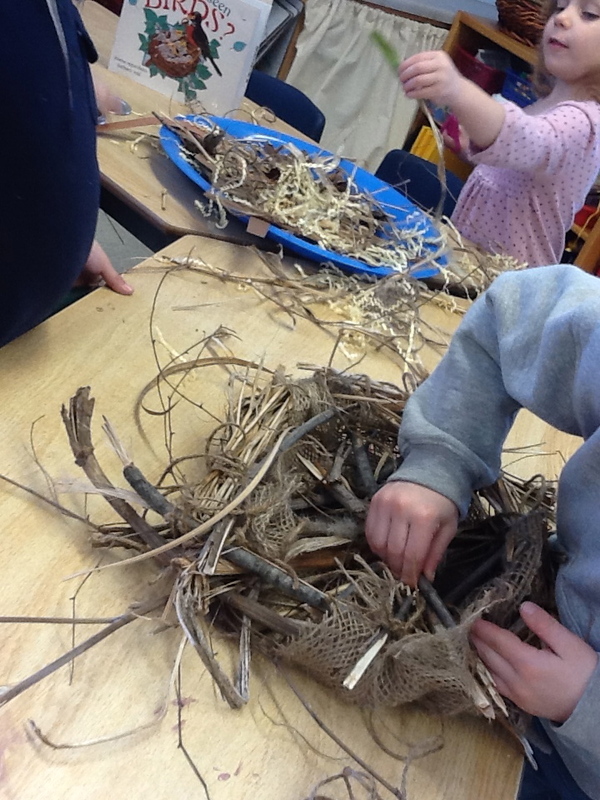 They drew what they wanted the nest to look like, chose items that would work to build it (sticks, clay, twine, feathers, grass, string, etc.) And off I went to leave the student's to create. (PS. The table and floor were COVERED with bird nest building props-JUST A WARNING a mess is guaranteed!!!) But it was so much fun!! It also was quite amazing watching the nest begin to take shape. By the end of the day almost all of the students had volunteered to assist some way or some how. They were all so very proud of what they had created. With the suggestion, from a small group of students we have attached our new nest to the sticks hanging from our ceiling. 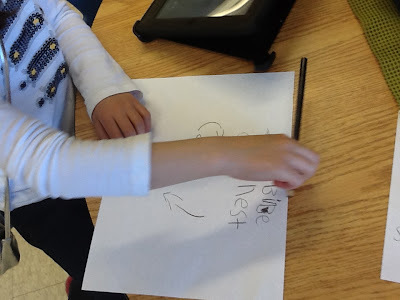 As an expansion of their creation- the next day, I printed off several pictures of different types of birds to place in the nest and around the room through the week. Because this is such a big piece to our room and so many of our students take ownership and pride in this, I had a strong feeling they would notice if a bird was perched up in the nest, hoping it would strike interest for new discovery. Sure enough once one student noticed the robin the nest, student's were finding robins in books and drawing robins, asking questions about the blue eyes inside the nest. Building a new home out of blocks. It began to become contagious! What an exciting week! Can't wait to see what this week brings! Above is an example of incredible, independent documentation from one of our students. She wanted to be a researcher sharing her knowledge about a "robin." And how it comes to be. It's been a little while since my last post! busy, busy, busy and seems to have escaped me. I'm excited to say; that our classroom has been glowing with energy, excitement and exploration! The spring weather is around the corner (I just know it) and so much has happened over the last month. Our students have grown so much since December and are finding new ways to create their own learning, which is super exciting as well. I hope that all of you are finding amazing moments within your classrooms as well. It is crazy to think that we only have three months left of this school year! The photos below was an expansion idea; off of their sewing interest. While discovering that our plastic needles that were available for us to use within the room were "tough" to get through any of the material. 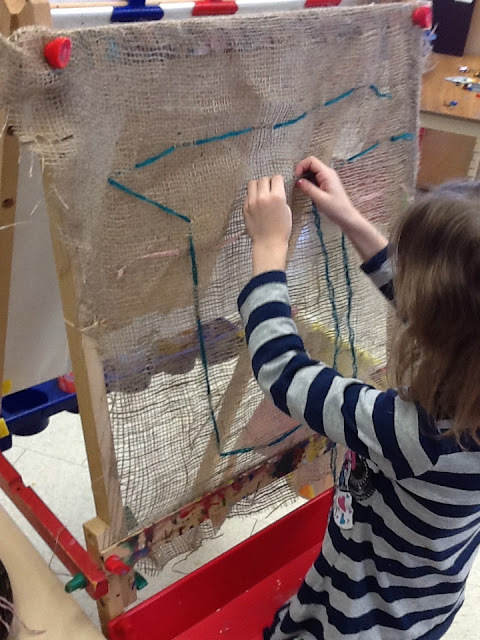 I happened to find an extra roll of burlap in my stroage room at home and thought it may work well as the "canvas" for sewing. 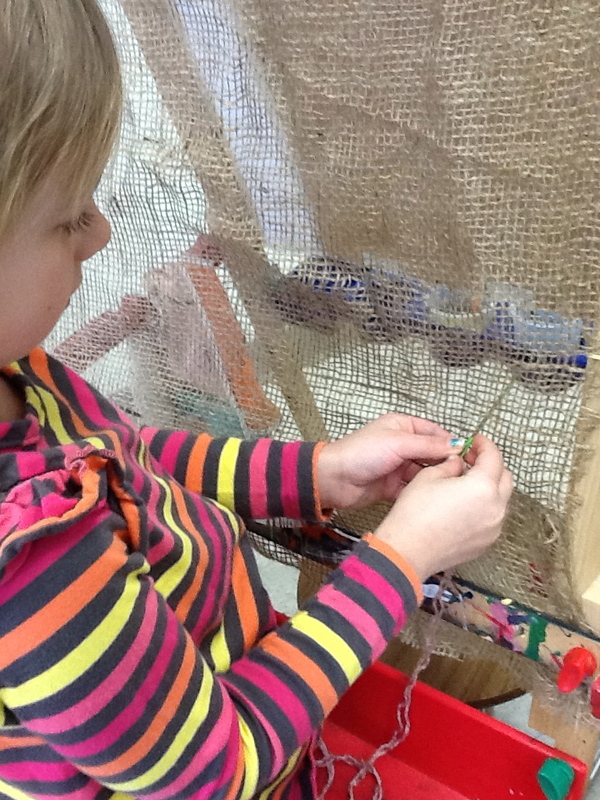 It was neutral, easy to display and it allowed the children to sew and create with ease. This was such a great idea! I loved it. 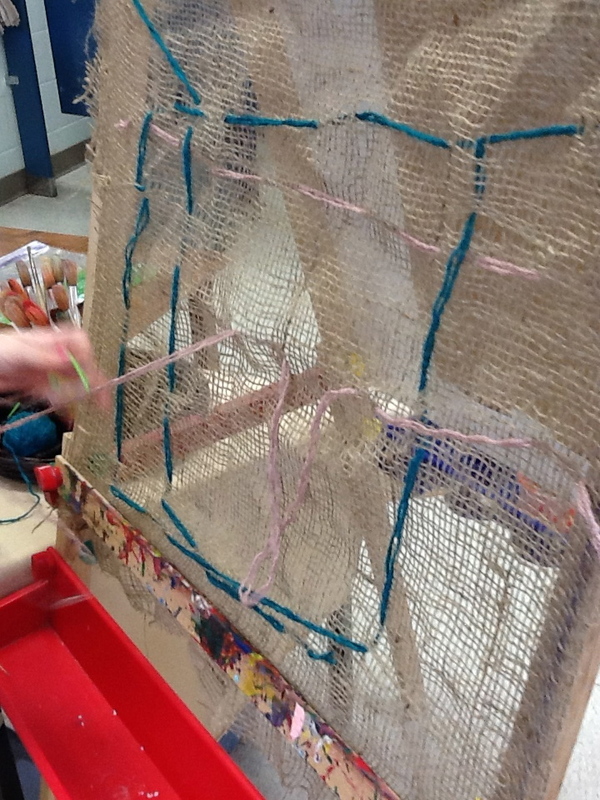 I left out different coloured yarn and our plastic needles and away the students went. Such a great way to promote fine motor skills as well. that documentation pieces fit perfectly on! Over the last few months I wanted to really focus on identifying "individuality" with each student. 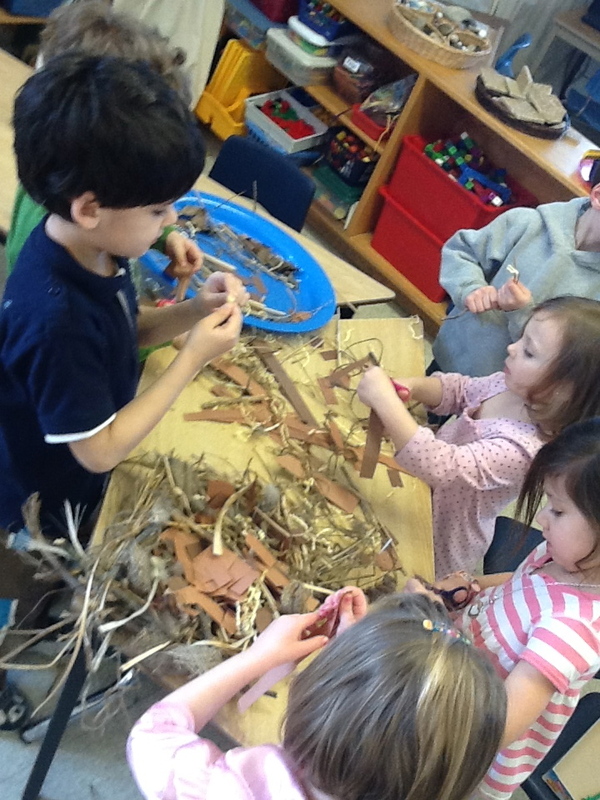 Beginning with creating their environment, having them take part in all aspects of building up our room, taking all school labels out and having the students co-construct all of the pieces that "they" need to feel a sense of organization. What a drastic change in attitude. Such a positive vibe is sent throughout of room with just simple easy steps of allowing them the freedom to create. This activity below is an example of learning "Who we are?" We have added mirrors throughout our room to create framework, reflection, interest and perspective. 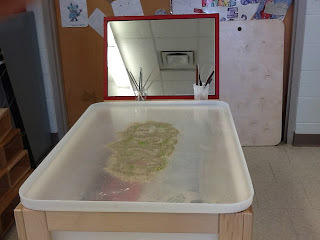 As we began added these pieces I noticed the students sitting and staring at themselves & making faces, talking to friends through the mirrors and bringing their activities over to where the mirrors were placed. Kindergarten children have such an egocentric mind. As I sat with them, discussing what they saw & what they noticed. I realized this was a great opportunity to document; the description that was being used, comparisons between size, colour, depth. What a teachable moment! I left behind one white window write; as I stepped away. Staying close to observe the outcome, I noticed instead, they began drawing circles on a piece of paper. Since it was white I observed a student looking at the tip of it for several seconds and realizing it will not work on the paper. She went over and found a black marker instead. (A great example of problem solving & using what she already knows.) She began to draw the shape of her face, making reference to the mirror. 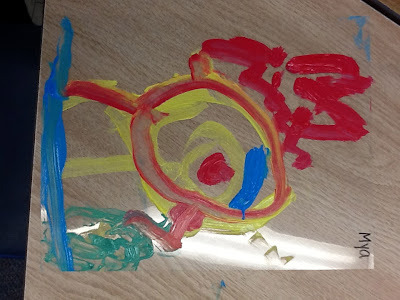 Through conversation with another child, she began to add eyes and a nose. As her portrait began to grow others around her began to join. Throughout the week I left these materials out again and again. On the third day, a child and I were sitting and having a conversation about taking photos on the iPad. We were playing around with the app and he wanted to use his picture that we took together for his drawing. As he began his drawing others waited patiently to take their photos and draw them. look to them, which is perfect! There is no right or wrong answer to how one views themselves. Yes, eyes are generally located in a certain area and a nose is generally centred on the face but this is another simple step towards building confidence, self esteem and the freedom to create with out restriction. Displaying these beautiful pieces allows each child to see that everyone is different and that is something that we honour and cherish within our room. Please take a minute to LISTEN. As I walked away from an inspiring experience with a great group of people yesterday. This song came on the car radio. Gave me goosebumps. Such "true" lyrics for life and all that we do. This put so much meaning behind why I do/did what I do/did. Change one path in life and you make a different.